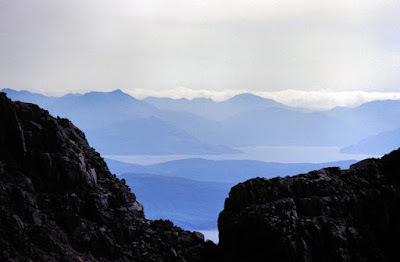 Many years ago, I decided to traverse the whole Cuillin Ridge in one go. This isn't something to do solo unless you are hard as nails, but luckily a friend Simon, who had dabbled in climbing and owned a rope, also wanted to fulfil this ambition - the finest mountaineering expedition in the British Isles. We set off for a few days camping in Glen Brittle. The weather was glorious. Our first day was leisurely, acclimatising ourselves to the exposure with a round of Coire Lagan. Up a steep and boggy path, the dark, naked skyline above. Before Coire Lagan, a branch path leads off to the Cioch. Small bivvy shelters dot the landscape, the most 'luxurious' a cave with the entrance largely bricked up with stones to form a cosy neuk. It has a name scratched in the rock outside - 'The Ritz'. Simon told me he had been onto the Cioch the previous year. I looked long and hard at it. I did not really fancy it. Higher up, a scrambly route leads onto Sgurr Sgumain. After dropping off Sgumain, the way is blocked by a fierce cliff, but drop a little way towards Coire a Ghrunnda and an easy chimney leads onto the ridge and a final scramble to Sgurr Alasdair. 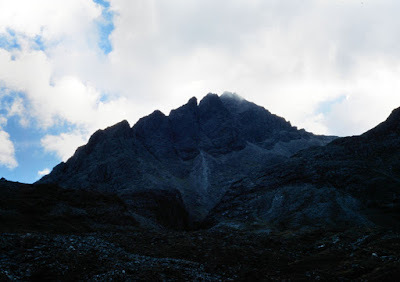 This shapely 992m peak is the summit of Skye. The way onwards leads to the Great Stone Chute, the only walking route to Sgurr Alasdair, and the steep face of Sgurr Thearlaich. On a previous visit, I had ascended Alasdair via the Chute - an unpleasantly loose gully - then the rope had come out for Thearlaich. However the face of Thearlaich is easily scrambled up, and we did not need the rope the whole day. At this point we came across a fit, fast fellow, clearly entirely at ease in this difficult environment. He had a walkie-talking and was being directed around by an unseen photographer somewhere in the distance. I had never heard of him, but have since seen his book - Gordon Stainforth's The Cuillin. "I'm heading down this way," he said, "see ya!" and bounded off as if he were crossing a flat field. He headed off towards Sgurr Dearg, turning a difficulty in the ridge on the right. We turned it on the left. This led down a gully, then a heart-stopping step over a ledge sloping unpleasantly above infinity, before returning to the relative safety of the Bealach Mhic Choinnich. If the last move has drained you of your nerve then tough - there is no easy way down from the bealach. A few awkward moves had us established on Collie's Ledge, and the rest was relatively easy, if still stimulatingly exposed. After summiting on Sgurr Mhic Choinnich, we ambled down to the bottom of the ridge below Sgurr Dearg, where we left some water bottles for our attempt the next day. Here, some superb screes (mainly now eroded) allowed us to surf to the bottom of Coire Lagan, a drop of nearly 300m in two minutes. A fine day's preparation. The next day we left frustratingly late in the heat of a sweltering afternoon. But there was no hurry, as our plan was to bivvy halfway along the ridge. There was an important reason for this - we wanted to have a good amount of time and energy when we completed the ridge to get as drunk as possible in the Sligachan Hotel. There is no shelter from the sun on the Cuillin ridge, and we felt the heat, rocks squeaking underfoot and scuffing our boots as an eagle soared high above. You have to work for the peaks at the end of the ridge and it took an age to contour round into Coire a Ghrunnda and make our way up the rubbly flank of Sgurr nan Eag. Finally achieving the ridge was a relief, and we headed south for the elegant spire of Gars-bheinn, the southernmost peak. From now on, we were doing the traverse. Sgurr nan Eag is fairly easy, then a detour off-ridge to Sgurr Dubh Mor, a new Munro for me. In mist this route would be difficult. From here we avoided the T-D Gap by dropping into Coire a Ghrunnda and contouring round to Sgurr Sgumain, where we picked up the previous day's route. 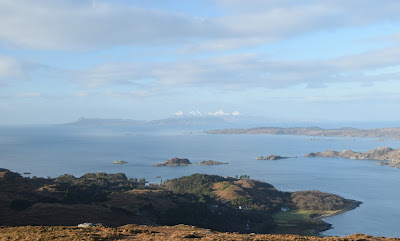 At the top of Sgurr Alasdair we met a couple of American girls. "Can you tell us the easiest way down?" they asked. "We came up that gully - there is no way we are going back down it." Simon and I looked at each other. The Great Stone Chute is the only easy route up and down Sgurr Alasdair. They would have to go back down that way whether they liked it or not. Had we been gentlemen we would have gone with them - but we weren't. We were mountaineers. At midnight we awoke to thick mist and heavy rain. The famously changeable Skye weather had caught us out. It was dark and we had no torches. There was nothing else to do but to wait for daylight, shivering in our waterproofs under the foil blanket which provided no heat at all. As soon as we could see enough in the grey half-light of dawn we packed up and headed down the bealach, searching out with difficulty the tiny cairns which are the only marker of the safe route, glad of our foresight in choosing this spot to bivvy. It rained for the rest of the week. 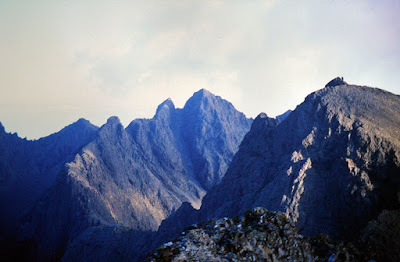 I never did do the full traverse of the Cuillin ridge - an ambition that remains to be fulfilled. I arrived at Sligachan at teatime. On a summer's evening, there was still plenty of time to climb the three northernmost Cuillin Munros - Bruach na Frithe, Am Bastier, and Sgurr nan Gillean. Sgurr nan Gillean sits at the termination of the jagged Black Cuillin ridge, facing across to the worn, rounded Red Cuillin. There are three routes to the top, all difficult. The climbers-only Pinnacle Ridge, the terrifying scramble of the West Ridge, and the deceptively named 'Tourist Route'. I was keen to tackle the West Ridge, and headed up a boggy path from Sligachan - all bog myrtle and midges - into the naked, rockier world of Coire a' Bhasteir, being careful to stick to the boiling black slabs and avoid the deep slot gorge of the All Dearg Beag. Above, the Basteir Tooth hung menacingly. To the left, the pinnacles of Pinnacle Ridge revealed themselves. Obscured in roadside views by being head-on, Pinnacle Ridge consists of four huge pinnacles, each bigger than its neighbour: culminating in the fifth pinnacle of Sgurr nan Gillean itself. I scanned the West Ridge looking for Nicholson's Chimney - I had read this was the easiest route onto the ridge. It was going to be key to a successful ascent. Steep but easy ground leads to the Bealach a' Bhasteir, where the real work of the evening begins. The West Ridge starts with an impassable face, but a short traverse round to the north leads to a couple of gullies. I investigated and attempted them, making sure I was comfortable with reversing each move. At the top of the gullies I popped out onto the West Ridge proper, and clung tightly to the rock. To take another step would be like stepping out onto a tightrope over the Niagra Falls. I reeled, gravity tugging at my feet. Suddenly, the vision of my mother weeping by my graveside popped into my head. Sick with awe, I carefully returned to the safety of the gully and descended. Had this been Nicholson's Chimney? 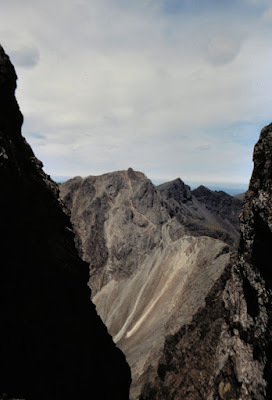 If so, it had led me straight to the narrowest and most terrifying part of the Cuillin Ridge. I was sure it was a further traverse along... but I looked, and nothing seemed obvious. Could I traverse all the way round to the gap between the summit and Knight's Peak on Pinnacle Ridge and try there? No, I had had my fill. I would content myself with Am Basteir and Bruach na Frithe, and tackle Sgurr nan Gillean via the Tourist Route next morning. Back at the campsite I fell into conversation with a man who was pissed off. The hotel staff, he informed me, had unpitched his tent whilst he was away and thrown it in the river. He had no proof of this, but had had an altercation with them the night before about camping next to the hotel. The trouble is it is not really a campsite - just an area of wild ground next to the Sligachan Hotel. The owners don't like people camping there for free and fouling the river with human waste, but this being Scotland and still stuck in the feudal age, they have no powers to create an official campsite. I had a few pints and decided that to be on the safe side, I would just sleep in my car. 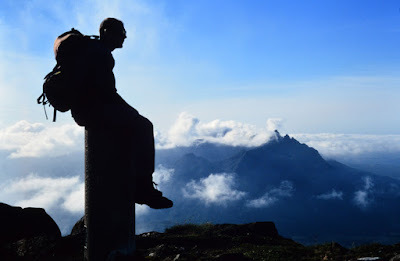 Changed days from when the elderly Cuillin pioneer Norman Collie would sit in the lounge of the Slig, looking up in melancholy reminisce at the hills he was now too infirm to climb, but not changed enough. And so next morning I set off early from the Sligachan Hotel, following the rough, boggy path along the Sligachan River; the day fine, warm, and full of promise. The path in the glen continued on for some way below the sunlit pinnacles of Pinnacle Ridge, until the summit itself was passed and the path turned uphill. Four points of contact were necessary at times, and the trail wasn't the easiest to follow. I wondered what else lay above. I hoped the Tourist Route would not defeat me as the West Ridge had done. Eventually the southern ridge of Sgurr nan Gillean is reached. I headed upwards and, each time I thought the ridge couldn't get any narrower (controlling my breathing, telling myself "slow and steady gets you there"), another even more exposed section appeared. I kept my head however, even over the hardest part: an awkward, undignified step over a precarious ledge. Sensationally exposed, yet a piece of pish compared to the West Ridge. At last I reached the tiny summit with a sense of relief and achievement. This is one of the very finest summits in the British Isles, surely the airiest outside a sea stack. 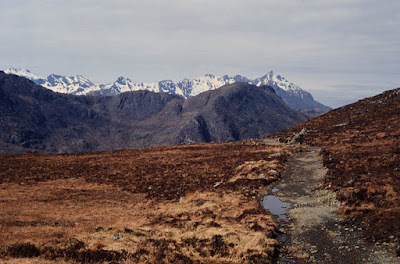 The entire main ridge of the Cuillin stretches away west and south, a complicated, densely sculptured area where the ordinary 1:50,000 scale Landranger map is entirely hopeless. 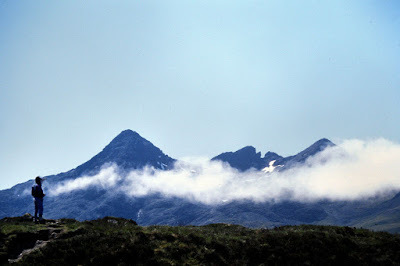 The whole Cuillin Ridge covers less ground area than the single Munro Ben Wyvis. East of Sgurr nan Gillean, across the deep trench of Glen Sligachan, lie the smoother, rounded Red Hills, and the long, jagged spine of Blaven. I looked at it. I looked at my watch. It was early enough in the day. I fancied climbing it too. Thus I gingerly retraced my steps over the Tourist Route, breathing more easily the lower I descended, yomped along Glen Sligachan out to the road, and drove to Torrin for my second Munro of the day, the joy of youth and movement in my veins.